I haven’t any doubt that the vast majority of us mourn the tragic death of Robin Williams, who brought laughter into our hearts and with it, wisdom too. And yet there are always a few, the ghouls I call them, who surface in such tragedies to verbally vandalize our grief with mindless, and often, acerbic commentary. Recently a bicyclist was killed here in Lexington KY by a speeding motorist, only to have one Facebook reader comment that bicyclists shouldn’t be on the streets. Pray then, where should they ride? On sidewalks? But it gets worse than such obvious, and silly, over-generalization. We’ve all come across those who practice a calculated meanness in exploiting social media for personal whim. These ghouls cannot tolerate an opinion different from their own, particularly when it comes to religion or politics, subjects notorious for generating heat. But ghouls also show up in Amazon book reviews, for instance, or even in discussion forums that, more often than not, are dominated by one perspective. Cross the line, and you get personal attack rather than reasoned argument. I saw this recently in a forum perusing the effectiveness of a low carb vs low fat diet. When one reader contended graciously for the low fat approach the forum became a piling on of verbal abuse. I dub this the cascading effect, or the tendency of one negative comment to generate others. 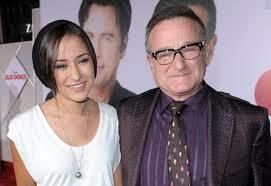 But returning to Robin Williams, his daughter Zelda has just closed her Twitter account. She had been receiving photo shop images of her father’s body along with obscene commentary. What transforms otherwise ordinary folks we rub elbows with everyday into Internet ghouls? It goes back to anonymity, or the disconnect effect. When we lose face-to-face contact replete with body language and verbal cues of tone, we drift perilously close to abandoning the etiquette of meaningful communication in losing connection with our readers. Mental short cuts take over and we say dumb things. We forfeit empathy. But in all fairness, the disconnect effect isn’t confined to the Internet. I have known this first hand as a English teacher at the college level. It’s the writing act itself that submits us to this danger, whether an email, a letter, or an opinion piece in a newspaper. Accordingly, the fundamental axiom of all effective communication, written or oral, is maintaining awareness of one’s audience, which should spill over into our selecting our words carefully, monitoring our tone, shaping our transitions, being open to a reader’s perspective. Mindfulness is the seasoning of all effective communication. While the social media can be invaluable in consolidating humanity for good ends, by its very nature, it is not without risk, so best be careful where you tread and cautious in what you reveal about yourself. The vast majority of Internet users are motivated with good intent; but it takes just a few to spoil things for the many. This entry was posted in Psychology, Reflections, Technology and tagged ghouls, Robin Williams, sychology, technology, the Internet, Twitter abvuse, Zelda Williams. Bookmark the permalink.